Many of us carry around aches and pains that we don’t fully understand and it’s not uncommon for us to simply accept that our feet hurt at times, or that we experience discomfort when we walk. In truth though, no one should have to live in pain and the human body should be perfectly capable of rectifying any and all discomfort. If you find yourself struggling to move around freely, then you should make an effort to get to the bottom of what is causing it. Very often, the culprit might be tendonitis. Read on and we’ll look in more detail at what tendonitis is and what causes it. Tendonitis is simply inflammation and/or irritation of the tendons. This can cause pain and swelling in the affected area, make exercise and activity difficulty and potentially cause biomechanical compensation leading to further injury. Tendonitis is very often caused by injury or direct impact but can also be the result of overuse. If you walk quickly a lot on your way to work, then this might well lead to foot and ankle tendonitis for example. This is especially true if you happen to wear uncomfortable heels a lot of the time. Very often then, there won’t be any obvious cause of foot and ankle tendonitis but you may just notice that it starts to look swollen a lot of the time, or it hurts when you walk. There are a number of different tendons in your foot and ankle and the precise area affected can lead to slightly different symptoms. Achilles tendonitis for example is most likely to result in heel and calf pain. This tendon is found running down the back of the foot to the heel and can make walking painful – particularly the motion of lifting your foot off of the ground. Posterior tibial tendonitis meanwhile is identifiable as pain on the inner side of the foot. The posterior tibial tendon runs along this edge and you will normally feel pain when you push off the ground with your foot if this is the area that’s affected. Peroneal tendonitis meanwhile is pain on the back and outer side of the foot and similarly will be felt when you’re pushing through the floor. 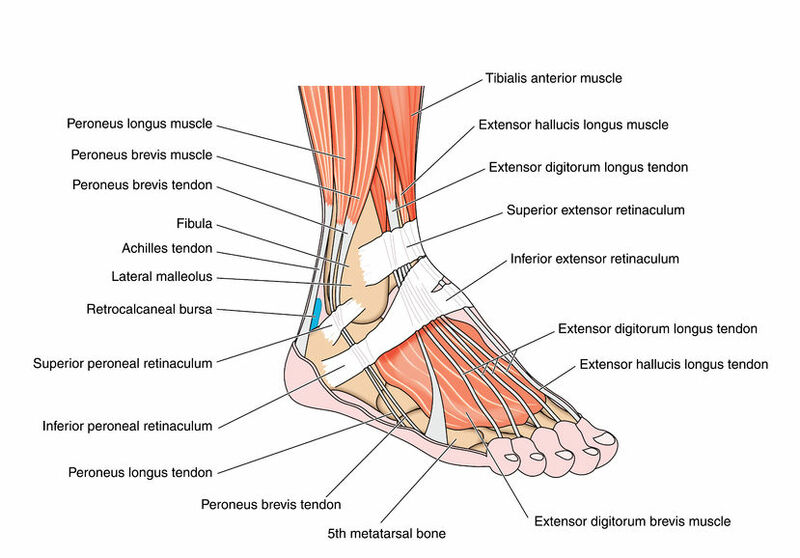 Extensor tendonitis is pain located on the top of the foot – this is the tendon used to lift the toes and point them to the ceiling. This is a rarer form of tendonitis and might make it difficult for you to fit your foot into your shoe. 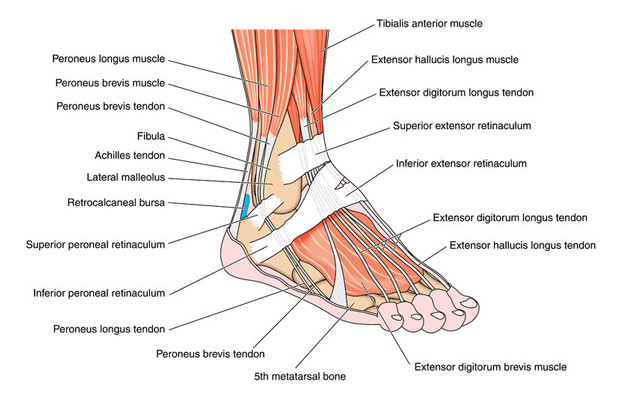 Finally, anterior tibial tendonitis is pain located at the front of the foot. This pain is most often felt when coming down the stairs or when descending a gradient. Tendons are very strong and have the ability to heal well on their own. However, if you continuously keep placing strain on them, then they won’t get the chance to recover. What’s more, is that swelling might cause your feet to press on the insides of your shoes, thereby exacerbating the condition. The best way to encourage your tendonitis to heal quickly then, is simply to take some time off of your feet. Rest your leg and keep it elevated when possible while icing. If you can rest properly, then you should be able to see recovery in two to three months. If you are an athlete, this might mean taking time out of your usual training. This can be easier said than done for some people however. If you walk to work every morning, then you can’t very easily avoid putting pressure on your foot. In this case, you should just rest your leg as much as possible. This might mean asking your partner or a colleague to drop you in to work in the mornings, or it might mean getting the bus closer to where you work and walking less as a result. You should also avoid wearing heels and instead look for comfortable shoes that will offer support. A compress can also be helpful, as can elevating your foot on a chair while at work. Keep ‘RICE’ (rest, ice, compression and elevation) in mind. If you find that this doesn’t help, then you might need anti-inflammatory medication to speed up your recovery. This might include cortisone injections into the affected area. If pain persists, then make sure to see your doctor. If you find that you regularly suffer from tendonitis in the foot and ankle area, then you may want to look into your gait and footwear. Corrective orthotics might be useful, especially if you have incorrect bone structure in your feet.